Mohammad Sayeed was kidnapped in Srinagar by the members of Jammu and Kashmir Liberation Front (JKLF), a separatist group based in Kashmir. In lieu of her release, the kidnappers demanded the release of five militants— Sheikh Abdul Hameed, Sher Khan, a Pakistani militant; Noor Muhammad Kalwal; Muhammed Altaf Bhat; and Javeed Ahmed Zargar. The Government-led Prime Minister V. P. Singh met the demand and she was released on December 13. The Central Bureau of Investigation (CBI) blamed JKLF leaders— Mohammad Yaseen Malik, Manzoor Ahmed Sofi, Javed Ahmed Mir and Showkat Ahmed Bakshi, Javed Ahmed Zargar and Ali Muhammad Mir for kidnapping and conspiracy. After the abduction, a case was filed in Police station Sadar in Srinagar City. The FIR No.339 was registered on 8 December 1989 under Sections 364, 368 RPC, Section 3(1) TADA Act and 25 Indian Arms Act, against unknown persons. Almost after three decades, the case against Yasin Malik, the main accused and others, was shifted to Jammu for proceedings on CBI’s plea. According to official sources, this was done for the ‘speedy trial’ of the case while people here see it as part of the tough approach towards Kashmir’s separatists by New Delhi. In 2009, the High court stayed the trial against Mohammad Yasin Malik and others in the case before a Tada court in Jammu. On March 13, the petitions filed by CBI in High Court, seeking vacation of the stay on trial and shifting the proceedings to Jammu in the kidnapping and killing of five Air Force officials cases from Srinagar to Jammu decided to be heard in the Jammu wing of the court as per the high court rules and circular issued by it in this regard. 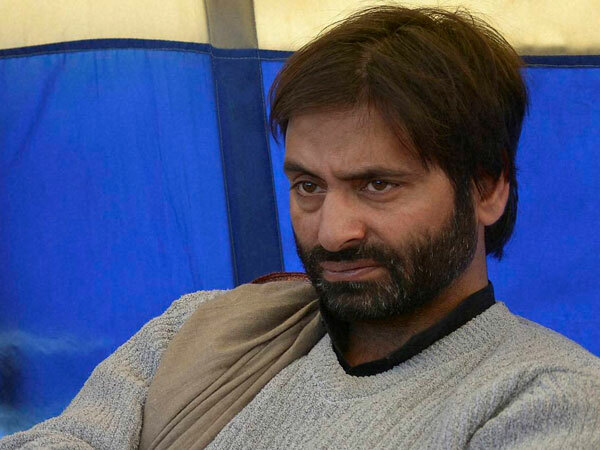 The CBI counsel Tahir Majid Shamsi had filed a transfer appeal before the Srinagar wing of J&K High Court contending that the main accused, Yasin Malik, is an influential person in the state which is likely going to influence the proceedings of the matter. “The writ petitions cannot be taken up for consideration at Srinagar Wing and have to be sent to the Jammu Wing for hearing and decision in accordance with Circular 6 dated 18.12.2010 and Guideline 94 dated 7th December 2018,” a bench of Chief Justice Gita Mittal said. On Monday, the HC reserved the orders after a plea. “All other steps including hearing, consideration and decision have to be by the Wing to which it relates. The petitioners have accepted this when applications seeking permission to file the writ petitions relating to the Jammu Wing at the Srinagar Wing was sought,” the court said. The writ petitions, the court reiterated, can be heard and decided only by the Wing to which the matters relate i.e., the Jammu Wing, the court said. According to the CBI, Rubiya Syed was kidnapped while she was going in a Tata Mini Bus from Lal Ded Hospital her to her house at Nowgam in outskirts of Srinagar. She was taken to some unknown place by the militants travelling in the same minibus and they threatened to kill her in case their demands were not met and “created terror amongst all the passengers by showing gun and pistols to them”. After completion of the investigation in the case, the charge sheet was filed by the CBI on 18.09.1990 under Section 364, 368, 109 and 34 RPC, Section 3(1) TADA and Section 27 of Arms Act, before the court of 3rd Additional Sessions Judge Jammu— the designated court under the TADA Act. During the pendency of trial in this case, on 25th October 2010, an application was filed by the accused persons seeking transfer of the case to the designated TADA court at Srinagar. The CBI filed objections and opposed the application. It is important to point out that Yasin Malik is also the prime accused in the killing of four Indian Air Force personnel in Srinagar on 25, January 1990. According to an FIR registered in the Police Station Sadder in Srinagar, in the indiscriminate firing 40 employees including a woman were injured, and two died on the spot. The case was registered by the CBI and on completion of the investigation, a charge sheet was filed on 31st August 1990 under Section 302 RPC of RPC, Section 3 and 4 of TADA Act and Section 27 of the Arms Act against Muhammad Yaseen Malik and five others, before the designated TADA Court at Jammu. Both the cases were transferred to Srinagar from Jammu and in April 2009, Srinagar wing of the J&K High Court stayed Yasin Malik’s trial in a designated TADA court in Jammu. Now both the cases have been transferred back to Jammu for further proceedings. Political experts in Kashmir believe that the opening of the 29-years-old case is just “propaganda” by the Modi-led government to win the upcoming elections. They believe shifting of nearly 3 decades old case to Jammu as Modi’s “Muscular Policy’ towards Kashmir. “It is the changing approach of current the government in the centre and shifting of Yasin Malik’s case to Jammu that too after decades is the part of the same approach and I think this will continue till the elections are not over,” said Professor Noor Ahmad Baba, a Political expert in Kashmir. A staunch supporter of JKLF, who wished not to be named due to security reasons, said Kashmiris have been always used by the Indian politicians for the political benefits. “Tell me why a 30-year-old case was reopened? If Yasin Malik was involved in the kidnapping why didn’t they punish him in 30 years,” he questioned. Talking to this reporter, Javeed Ahmed Mir, one of the accused allegedly involved in the kidnapping cases, said the JKLF announced a unilateral ceasefire in 1995 after the assurance of an American diplomat, Robin Raphel, who assured them that the GoI will support peace initiatives if JKLF leaves the path of violence. As a result, Mir said, they left gun culture and choose the non-violent means to demand their rights but the BJP government led by Narendra Modi is pushing them to choose the gun again. “We don’t know why we are being targeted in the decades-old case. If we are demanding our right through peaceful means, then why are our leaders being detained without any charges?” asked Meer. The raids on separatists leaders seem to have had no impact, especially on JKLF. Their office at Masuima locality in Srinagar was filled with a dozen of activist discussing the Kashmir situation. “We have hundreds of cases going on in different courts. Over 100 of our workers are behind bars. I am telling you nothing is going to happen to Yasin Malik,” said one of the activists, wishing anonymity. “Modi wants to show his presence and his psychological warfare to the people of Kashmir, nothing else,” he says.